Ever since being part of the pot in a high-stakes poker game, elfin outcast Kai Gracen figures he used up his good karma when Dempsey, a human Stalker, won the hand and took him in. Following the violent merge of Earth and Underhill, the human and elfin races are left with a messy, monster-ridden world, and Stalkers are the only cavalry willing to ride to someone’s rescue when something shadowy appears. It’s a hard life but one Kai likes—filled with bounty, a few friends, and most importantly, no other elfin around to remind him of his past. And killing monsters is easy. Especially since he’s one himself. But when a sidhe lord named Ryder arrives in San Diego, Kai is conscripted to do a job for Ryder’s fledgling Dawn Court. It’s supposed to be a simple run up the coast during dragon-mating season to retrieve a pregnant human woman seeking sanctuary. Easy, quick, and best of all, profitable. 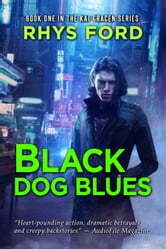 But Kai ends up in the middle of a deadly bloodline feud he has no hope of escaping. No one ever got rich being a Stalker. But then few of them got old, either, and it doesn’t look like Kai will be the exception.